What better way is there to celebrate the life of the man who shaped the Chicago lakefront than by a memorial for his contribution. Beginning in 1909, Chicago’s central area began to reshape based on the book “The Plan of Chicago”, also known as the Burnham Plan, coauthored by Daniel Burnham. 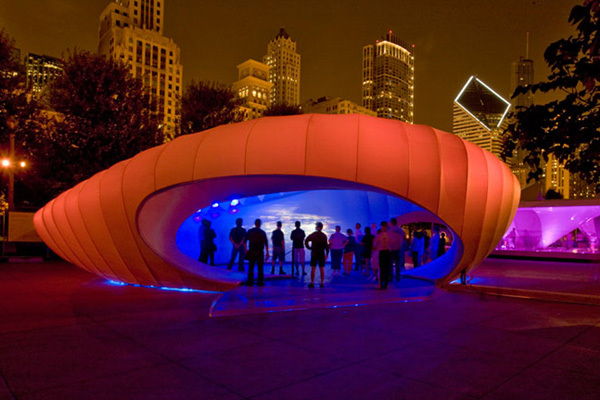 Fast forward 100 years to 2009 and we’re standing in Chicago’s Millennium Park in front of an architectural masterpiece that covers 3,185 square feet and stands nearly 20feet in height, paying tribute to Burnham during a millennial celebration of his legacy while welcoming the future with innovative ideas and technologies. Articulation was a key ingredient to understand and accomplish in order to have success on such an elaborate piece of architecture. Although six months was originally slated for the build, the original fabricator was pulled off of the project due to failing to complete the project on time and also for producing a frame that could not pass code. The deadline had passed and the project was in jeopardy. It was at that time that Fabric Images, Inc. was reached out to for the completion of the project. It was the confidence the customer gained from meeting with the FI team that led to Fabric Images being awarded the project. Along with the importance of maintaining the vision was the actual construction of the design. Manufacturing ideas takes experience, passion and know-how; only then does an idea or design become reality. This is what endeared the Hadid Architects to Fabric Images. Fabric Images understood the vision and knew how to fabricate it. While the concept took many directions, a single focus was in place- with commitment and dedication, finish by August 1 (30 days!). 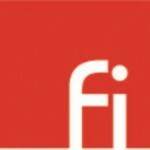 Consideration 1: The high profile nature and on-site manufacturing of the project puts the entire FI team on display. Consideration 2: On-site manufacturing means moving all equipment, materials and people to the site for the next 30 days. Consideration 3: Tight timeline and unknown variables will require on-site staff to work 10 to 12 hour days (or longer). Consideration 4: By taking the project over from a smaller local manufacturer out of Lincolnwood, IL, we are working with an unknown existing structure. Knowing that it is not structurally sound, it will be necessary to evaluate the entire framework structure that currently exists and determine the needs and repairs required. Consideration 5: The uniqueness of this project requires a great deal of attention to be paid to the details. It is essential that we understand and capture the details in the end product. Before making it to the end, there were many hurdles to conquer from the beginning. 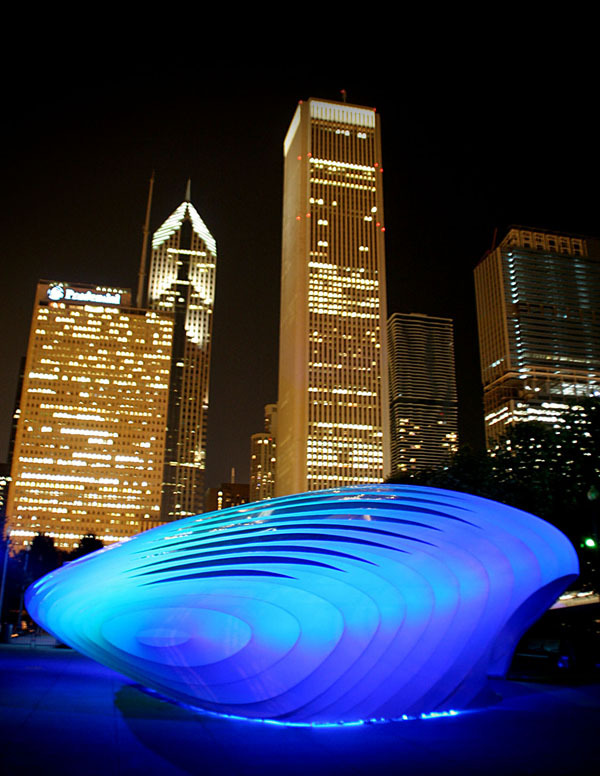 First off, there was a frame structure sitting in Millennium Park that was not up to code. With not having time or budget to start from scratch, Fabric Images had to re-engineer and re-work the structure from south to north. This took place in correlation with the fabric fittings nearly to the deadline. 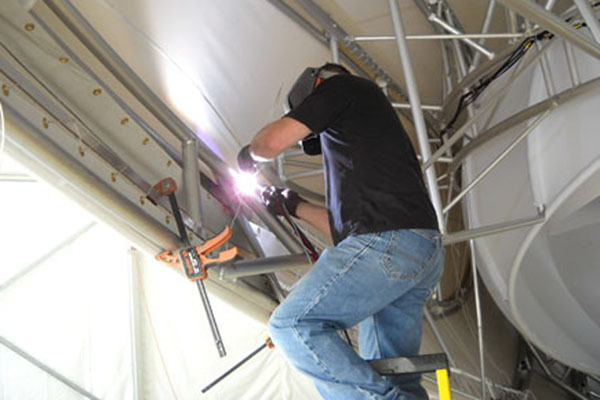 These modifications included adding 300 crossbars and weldments and redoing 19 of the 24 trusses. Starting from scratch, Fabric Images had to engineer the fabric covering inside and out, fine tuning zipper details and seaming along the way. Within the design there was not one straight angle, nothing was linear and there were curves upon curves. It is a tricky shape for a fabric without any stretch. Covering the exterior of the Pavilion was Starfire, a polyester-cotton blend chosen for its acrylic topcoat that facilitates cleaning and is fade and mildew resistant. By creating precise patterns, the fabric was cut to the proper shape for fitting to the frame smoothly and tautly. 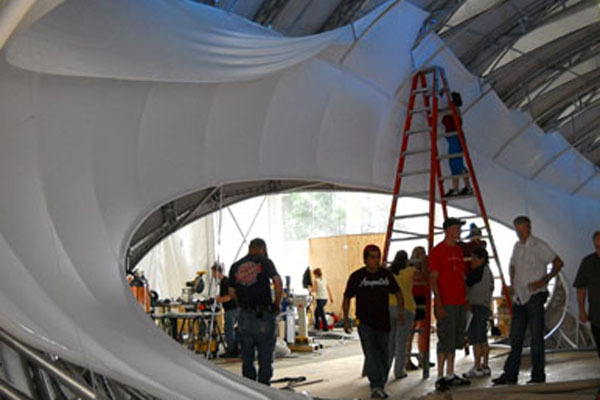 While the exterior fabric was being worked on at the installation site, the interior fabric was started back at the Fabric Images manufacturing facility. 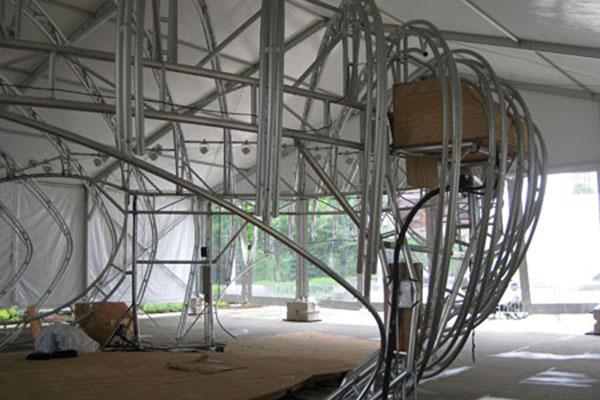 The interior of the pavilion would act as a surface for immersive projections and film for the duration of the installation. The film, created by artist Thomas Gray, impressionistically reflects Chicago’s transformation from 1909 to present, and includes the voices of people throughout the Chicago region sharing their visions of the future. To create the most functionality a combination of fabrics were utilized. A majority of the interior was clad with Celtic, a woven polyester fabric, but placed in the areas of projections was Flagknit, a firmer polyester fabric with a slight sheen. 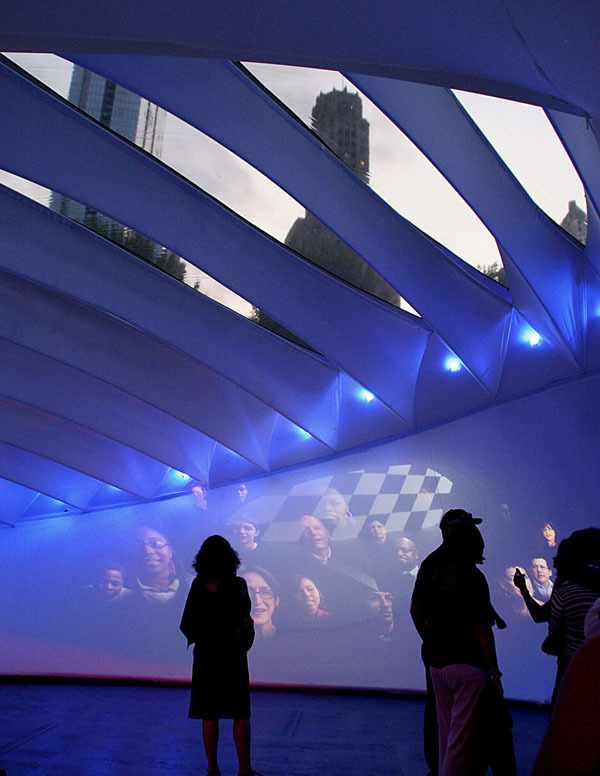 With the video being rear-projected, the reflective surface of FlagKnit allowed for clear pass-through and high quality of the projections. 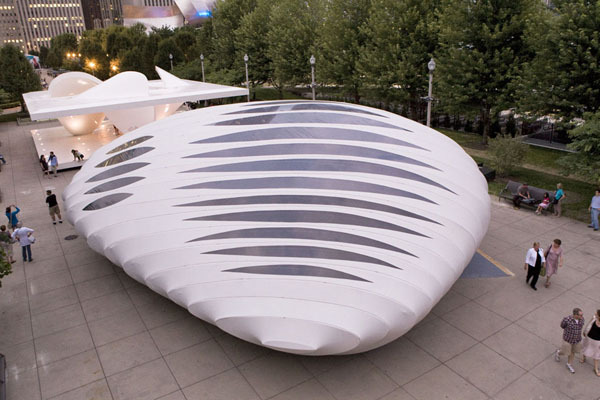 To keep the concave curvature to the interior of the pavilion, the fabric was tailored with a series of pockets that connected it back to the framework. The last component of the fabric skin was in relation to the skylights. The purpose of these areas was to play with the contrast of light and shadow on the interior curvature of the pavilion during the daylight. In order to keep the entire structure covered, but still let light pass through, a combination of clear vinyl and black vinyl encapsulated polyester mesh. 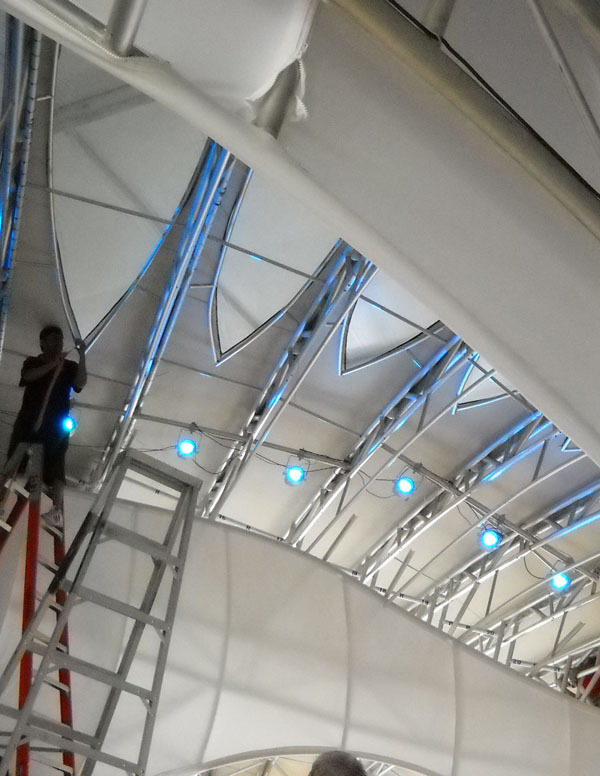 The structure and fabric covering had to account for many extraneous factors, such as electrical, lighting, projection, photography, music, sound and the synchronization of all of these. In the end… 28 days, 14 hours per day, 1 vision, 1 task, 4 welders, 6 dreamweavers, 4 fabrication assistants, 2 project managers, 1 vision casting guru, 4 sewing machines, 1 metal bending machine, 2 welding stations, 7,000 pieces of tubing, 300 support weldments, a whole lot of fabric and a vision brought to life.